(Newser) – John Roberts told the Senate in 2005 that the Supreme Court was too polarized, and as chief justice he promised to encourage harmony between the court's left and right blocs. Last week he delivered, with two 8-1 decisions on the Voting Rights Act and the strip-search of a 13-year-old girl. But as the Los Angeles Times reports, those majorities are all too rare—the court is still splitting many decisions 5-4 along traditional liberal and conservative lines. As a nominee, Roberts made an Obama-style pledge to bring justices together around unanimous verdicts, even if it meant ruling on narrower grounds. But the court has split as usual on issues from police powers to the prosecution of Bush-era officials, and today the justices will probably do the same on an affirmative action case. "The hope Roberts held out for a congenial, consensus court has not been realized," said one professor. "But this week was impressive." Not going to happen. 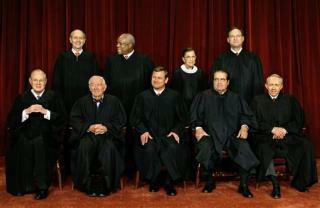 The views of these justices are too far apart.